Harmony is a min pin/doxie mix, 5 years, 14 pounds. Harmonee had a very tough time before rescue. She was on her own, found pregnant, her babies died before birth, and Harmonee had a terrible infection. All better now, Harmonee is quite shy with strangers, needs a few days to feel comfortable in a new place. Then she's a character, funny and bright, loves to cuddle under blankets. A quiet home is best for Harmonee, though she'd enjoy a doggie friend to play with. She likes to pile toys, especially her stuffed duck, in her doggie bed and often steals her foster mom's shoes for bedtime! She doesn't chew or hurt them in any way. Harmonee so deserves the best forever home where she can be a pampered pup! Please reach out and/or submit an application to adopt at http://www.almosthomerescue.org/onlineforms/adoptform.htm. 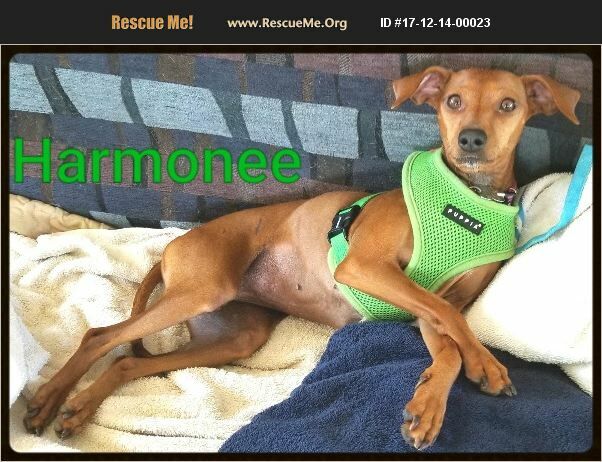 Harmonee's adoption fee is $275 to help rescue.